SB20 Irish sailors will be back on the waterfront next month when the Royal Irish Yacht Club hosts the class dinner. Not only will new year exploits in Tasmania be a hot topic of conversation but there will also be plenty of chat on the staging of the SB20 European Championships at the Dun Laoghaire club in eight months time. The class dinner will be held at the RIYC on 3rd March 2018 at 19.30hrs, just six weeks before the first races of the Dublin Bay Sailing Club summer season where the 15–boat fleet will be back on the water. March 3 will see a presentation of prizes and a de-brief from team Ireland from Hobart, Tasmania. Afloat.ie carried daily reports from the World Champs here. Meanwhile, a new website is up and running here for the European Championships in Dun Laoghaire, an event touted by class president Colin Galavan as a 'rare opportunity to compete in a European Championships on home waters'. The Royal Irish Yacht Club awarded British Olympic Sailing trialist Saskia Tidey its 'Helm/Boat of the Year Award' at its recent RIYC Sailing Awards that took place in the Dun Laoghaire Club on Saturday, 27th January 2018. The Dun Laoghaire sailor previously sailed for Ireland in Rio before switching to sail for Team GB in a bid for Tokyo 2020. She was previously awarded an Afloat.ie Sailor of the Month award in May for her 2017 achievements with new team mate Charlotte Dobson of Scotland. The Cruiser of the Year awward went to Drewry Pearson and the Best International Racing Result went to D. Hayes, D. O'Connor, John Sisk in Hallowe'en. The Best IRC result went to Sybil Mc Cormack & Ken Lawless in Cartoon and the best Cruiser Racer Echo Result Tim Goodbody Richard Goodbody sailing White Mischief. Other results included: Best Dinghy David McFarlane; Best One Design Result Jerry & James Dowling - Bad Kilcullen; Best White Sail Result Pat Rigney - The Great Escape; Contribution to Sailing Michael Boyd; Rear Commodore's Award (special) Charles Broadhead - Persistence; Volunteer of the Year - House Anne Mills and Volunteer of the Year - Sailing Gill O'Connor. More details on the RIYC website here. Any cruising enthusiast or would-be cruising enthusiast who has ever dreamt of sailing away in their own boat to the balmy climate and sheltered islands of the Pacific and other warm and sunny destinations is welcome at the Royal Irish Yacht Club in Dun Laoghaire on Thursday December 7th at 7.30pm writes W M Nixon. The Club is hosting a talk by one of the most remarkable couples in Irish sailing, Myra Reid and Paraic O’Maolriada of Kinsale. When their retirement was approaching, they had a plan. They’d buy a boat, and sail round the world. They hadn’t done much sailing, if any, before. But they felt confident that with research and good advice, they could source the right boat, and once they’d learnt the basics of sailing, their skills would improve as they sailed along. 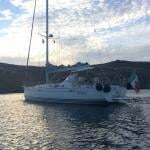 They started extremely well by buying a 1996 Amel Super Maramu 54 ketch - the gold standard in trouble-free ocean cruisers. They called her Saol Eile, and off they went. They’d thought they’d be gone maybe two years, but it took six because they were enjoying themselves so much. And then when they slipped quietly back into Kinsale in July 2016, it was a while before the Irish sailing community fully realised the wonder of what they’d done. After six races sailed in blustery conditons off Dun Laoghaire, Rian Geraghty–McDonnell leads the 64-boat senior fleet from the National Yacht Club's Leah Rickard by three points. Third, after one discard, at the Royal Irish Yacht Club hosted event is Royal Cork's Harry Pritchard. Are you Interested in Sailing or Buying a Sigma 33? More details on the Sigma 33 class from the 2017 season below. The Volvo Dun Laoghaire Regatta was for the Sigma 33 one design class the third major open Championship of 2017. The season stared in Tarbert, Scotland at the end of May, with the Scottish series with ten competitors and was won by “Mayrise” James Miller of Cove Sailing Club (CCC) with four wins from eight races. The next event was in Helensburgh in Mid-June for the Class Championships which was won by “ Miss Behavin” Alan Lennox, Helensburgh Sailing Club. The 13–boat fleet completed eight of the ten planned races over the three days. The Dun Laoghaire Regatta series had 19 entries including nine from the home waters and ten visitors from Northern Ireland, Scotland, England, the Isle of Man and local boats from Arklow and Waterford. The nine race series was dominated the top six visiting boats. Most of them had competed in Tarbert and Helensburgh and benefited from the close racing at both events. It proved very difficult for local boats to break into the top six in any race. The racing was very competitive with places changing on all legs. The Dun Laoghaire Regatta series was won by Alan Harper & Kristy Robertson in “ Mayraise” The Irish Championship were run in conjunction with the regatta and won by Paul Prentice in “ Squawk” from the Royal Ulster Yacht Club. The Sigma 33’s were the biggest one design keelboat class at the regatta and this added to the more enjoyable competition for competitors. The visiting crews comprised young and experienced sailors, both men and women. It’s on occasions like that that you think of how good Tim Goodbody was in that he was regularly in the top three in such regattas. It wasn’t all racing and on the Friday night 120 of the fleet held a bicentennial Dinner in The Royal Irish Yacht Club. Prizes were presented to the winners of the day’s racing “ Mayrise” Alan Harper and Kristy Robertson CCC and “Rupert” Richard and Philip Lovegrove of the RStGYC. Thanks to Dun Laoghaire Harbour Company, each boat was presented with a History of the Harbour. The local fleet will recognise that they need to be more competitive as a fleet if they are to compete more successfully in this type of competitive regatta. There is a big incentive for the Class. In 2018, the Sigma 33 National Championships and Irish Championships will be held in Dun Laoghaire and 2019 is a Dun Laoghaire Regatta year. It is expected that similar entries to 2017 will compete each year. This also provides a great opportunity for young local sailors to acquire a Sigma 33 with a major event in local waters for each of the next two years and discover how successfully they could compete against the visitors and local sailors. It is a historical fact that when the new Harbour was being planned in Dun Laoghaire 200 years ago, very little if any provision was made to include shore-side facilities in the overall project. The magnificent new granite structure was envisaged purely as an Asylum Harbour to shelter ships waiting to enter or leave the port of Dublin, which in those days was restricted by a shallow entrance unusable at low tide. Far from providing those on board such vessels with convenient contact with the nearby and initially sparsely-inhabited shore, it was a matter of harbour planning policy that, ideally, there’d be no such contact whatever. Yet even at an early stage of the works, it was increasingly evident that it was potentially a magnificent amenity that would lend itself well to the expanding popular association of the seaside with leisure of all kinds, whether it be simply enjoying the bracing sea air, or interacting more dynamically with nautical activity through boat and water sports. So although the harbour was not considered finished until 1859, and to some extent has always continued as Work in Progress ever since, by 1859 a fashionable seaside town had already developed beside it, with much emphasis on harbour and sea-related events. The recent across-the-board success of the four-day Volvo Dun Laoghaire Regatta 2017, with a diverse fleet of 475 boats taking part, was a reminder of how long this supposedly utilitarian harbour has been central to the seaborn leisure activities of the people of Dublin, and particularly those who live in the immediate south county area in what is now Dun Laoghaire-Rathdown. In addition to the many sailing championships included in the impressive programme for 35 classes, the Regatta celebrated the Bicentenary of the beginning of work on the construction of the harbour in 1817, with 2017’s sailing programme seeing innovative Bicentenary events and special trophies. And of these trophies, arguably the most interesting were framed copies of an engraving showing the first recorded regatta at the harbour, which was staged in 1828, barely eleven year after the massive harbour works were started. The first Regatta of 1828. Copies of this engraving were awarded as prizes in the Volvo Dun Laoghaire Bicentenary Regatta 2017. There had been such a demand to utilise the recreational potential of the harbour that many noted racing yachts of the day were prepared to undertake their sailing competition from a harbour which was still a building site, and with very limited shoreside amenities at that. This was to become a theme of the Dun Laoghaire story. In fact, by the time the harbour had achieved the broad outline of its finished form in 1859, the waterfront had acquired the first clubhouse of what became the Royal St George Yacht Club as long ago as 1838, while the Royal Irish Yacht Club, having briefly thrived without a shore-base clubhouse at its foundation in 1831, was revived in 1846 and by 1851 had its magnificent clubhouse, the world’s oldest complete purpose-designed yacht club building, in place on the waterfront. This process of waterfront development continued with the Edward Yacht Club – now the National Yacht Club – completing the trio of substantial yacht club buildings on the main harbour in 1870, while in modern times it was just over fifty years ago that the Dun Laoghaire Motor Yacht Club came into being on the quayside in the inner Coal Harbour. These four clubhouses, while diverse in character and style, all share one characteristic. They are miracles of the skillful utilisation of very limited space. For although the town may have grown rapidly because of the existence of the harbour, such was the demand for building space on the fashionable waterfront, and the need for the provision of harbourside roads and a through railway, that the buildings actually serving the needs of ships, seafaring and recreational sailing, were crowded in along a very narrow waterfront strip. The Royal Irish YC clubhouse of 1851 as seen from the modern marina. This historic clubhouse was built and functioning eight years before the harbour was declared complete.Yet despite the severe limitations of the space available to them, the various waterfront organisations have continued to function and indeed thrive in their activities. So much so, in fact, that it could reasonably be claimed that the outstanding success of the Volvo Dun Laoghaire Regatta 2017, and particularly its Kingstown 200 celebratory highlight, has been a game-changer in reinforcing perceptions of the harbour’s potential. There is now definitely a viable future for Dun Laoghaire as a recreational leisure and sporting centre in the broadest sense, whether it be for sailing, rowing, other water sports, or simply enjoying the bracing sea air by walking the splendid main piers which - still largely in their superbly-built original form - have for so long been such an elegant aspect of Dublin Bay that many of us find ourselves thinking of them as natural features. However, in celebrating the great events of the Regatta of July 6th to 9th 2017, there is one important element in the modern Dun Laoghaire’s provision of facilities which is sometimes overlooked. Perhaps it’s because it simply gets on with what it was planned to do in a professional and unshowy style, for whatever reason these days we tend to take the existence of Dun Laoghaire Marina for granted. But the harbour’s contemporary year-round sailing programme, and its confident ability to provide totally secure berthing for up to 820 boats of all sizes up to superyachts and record-breaking giant multihulls, is all because of the quiet existence within it of the largest marina in Ireland, which provides hundreds of completely sheltered and fully-serviced pontoon berths in an area whicb formerly only had space for 70 swinging moorings, moorings which were by no means completely sheltered in all conditions. And yet this facility, still seen as new, is very much of the Harbour in that, of all the diverse maritime facilities on Dun Laoghaire waterfront, it is the Marina which is most water-based. Its footprint ashore is relatively minuscule. It has been allowed just enough space on land for the administrative/reception and services building. But apart from that, its own wide-ranging facilities are completely afloat, as the travel-hoist which serves the fleet is on a different area of Harbour Company land. Although that is leased to the Marina, it is in its turn sub-contracted out to be operated by MGM Boats Ltd, the multi-functional marine trade company which includes boatyard operations within its many areas of expertise. The long-established yacht clubs may have expanded their originally small sites to became more substantial spaces. But as the aerial photos tellingly reveal, the marina manages to provide its core activities and facilities with a minimal toehold ashore. Yet those core activities and facilities afloat are central to the sailing and boating success of modern Dun Laoghaire, and with the Marina now 16 years old – it officially opened on St Patrick’s Day 2001 – it is time and more to acknowledge its quiet yet very significant contribution. While the Marina is a significant presence afloat, its office footprint on the waterfront is very small, slotted in between the extended hard standing of the Royal Irish YC (right) and the marshalling yards for the former cross-channel ferry service (left). That significance can best be put into perspective by putting our minds back to 1986. While Dun Laoghaire Harbour may have been a pioneering facility in the way it developed between 1817 and 1859, by the final decades of the 20th Century it was clearly in need of modernisation, with the urgent need for the addition of properly sheltered pontoon berthing to keep it in line with facilities elsewhere - not just abroad, but also in Ireland, where places like Crosshaven, Howth and Bangor were beginning to enjoy full marina availability. While Dun Laoghaire sailing enthusiasts of the calibre of Olympic helmsman Jimmy Mooney had been advocating a marina for years in order to offset their harbour’s seriously exposed condition in northeast gales, there was understandable resistance among those who saw the harbour as a beautiful creation in its total and original concept, even if shoreside areas of it were disfigured by the facilities required by ferries operating the cross-channel route to Holyhead. But then in August 1986, Hurricane Charley struck. Force 12-plus northeasterlies caused enormous damage along Ireland’s East Coast, with Dun Laoghaire experiencing the perfect storm. The harbour was like a giant washing machine, and waterfront and fleet damage and loss was widespread, with classic yachts such as the Dublin Bay 24s and the Dublin Bay 21s – for so long an adornment of the harbour – suffering to such an extent that in effect it marked the end of the Dublin Bay 21s as an active class. After August 1986, the provision of a proper in-harbour marina became a question of “when” rather than “if”. Knowing how long contentious planning matters can take to be resolved in Ireland, it’s actually remarkable that a new marina, located within in-harbour breakwaters of a high standard to match the quality of the main piers, was in being just 15 years and seven months after the balance was tipped in its favour by Hurricane Charley. Of course there were many other factors involved in the successful implementation of this radical new development, and some people had been working in support of it for many years. As the new and superbly-sheltered amenity became increasingly accepted, supported and used, one of its longterm advocates famously remarked that it had taken 25 years for Dun Laoghaire Marina to become an overnight success. It may seem strange now that the new marina seemed so strange then, but we have to remember that the Dun Laoghaire Harbour into which it was inserted 16 years ago was a very different place. It was still an active ferry port, with a fully professional harbour staff in charge of the overall administration. But while the clubs were significant employers of professional staff for their facilities afloat and ashore, those employees were in turn answerable to the voluntary democratically-elected officers of each club. With the marina, however, everything was on a much larger scale. It had to be seen as a commercial proposition, run as a business by competent professionals who were answerable to a management company which in turn was answerable to its shareholders. 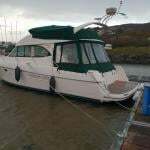 And of course the services of the marina were available to any competent boat-owner who was prepared to pay for its excellent facilities. Instead of mainly relying on a club ferry service to get you to and from your boat, you could now step on board as and when you wished. And while the marina management tried to cluster classes and groups of fellow club members in its berthing allocations if possible, it was by no means a requirement, and the relatively closed sailing community had to open its mind and attitudes to newcomers and strangers. It could have been impersonal, but it wasn’t, thanks to the extremely sensible selection by the owners of the marina’s General Managers. There have only been two since 2001, Hal Bleakley who was himself of the Dun Laoghaire sailing community through and through, and Paal Janson, who succeeded him in 2011 after working with him on the small but dedicated marina team for years. Hal Bleakley was a consummate amateur sailor and race officer whose professional life had been as Maintenance Director for Aer Lingus. It was the perfect CV for a challenging job which simply hadn’t existed in the complicated Dun Laoghaire matrix before. As for Paal Janson, as you’ll guess he’s of Norwegian descent, but he is very much of Ireland even if there’s a photo of a Janson ancestor’s sailing boat racing at Bergen in the 1920s on the walls of his office, which is more than just an office, it’s a control centre as well, as he can oversee the entire busy marina from it. Like Hal Bleakley, Paal Janson (he tends to be called Paul) brings a very useful professional background, as he was formerly a deck officer in the International Merchant Marine, accustomed to dealing calmly with all sorts of sea-related problems, and in ensuring that things run smoothly without fuss. With a staff of ten – three for the office and the others working throughout the extensive marina itself – he has been assiduous in keeping Dun Laoghaire marina in its position of high standing among international-level yacht harbours, which is such that it became the first coastal marina among the 23 in the Republic of Ireland to achieve the coveted Five Anchor Award. This was awarded originally in 2008, but more importantly it has been retained ever since, successfully coming through rigorous annual inspections. In retaining the Five Gold Anchors, you are at least dealing with people who understand what a successful marina is trying to do. But not everyone necessarily does so. Thus a challenge which Paal Janson has successfully overcome is getting recognition from Failte Ireland that his marina is a significant player in modern Ireland’s tourism boom. It has to be said that at times Failte Ireland moves in mysterious ways. You would have though that having a facility of the calibre of Dun Laoghaire Marina on the doorstep of a capital city would have been regarded immediately and enthusiastically as deserving some sort of official accreditation. But it took a while to persuade the powers-that-be a couple of years ago that it was worthy of Failte Ireland’s “Welcome Standard” of accreditation, and in fact 2016 was the first full year in which they enjoyed this official recognition, the first marina in Ireland to do so. From a tourism point of view, the presence of the marina can be beneficial in several ways. Apart from its functional value, it is a symbol of peace and prosperity. The very idea of “picturesque poverty” is now rightly regarded as a Victorian obscenity, but the notion of a cruising yacht going harmlessly on her way with her crew enjoying the experience is an extremely reassuring concept in an increasingly disturbed world. The quiet hint of a comfortable level of prosperity cannot be over-estimated. When Ireland plunged off the economic cliff with the collapse of the Celtic Tiger, tourism numbers plunged. After all, who wants to go on holiday in a country in the depressed grip of an economic recession? But as the green shoots of recovery strengthen, the mood lightens, and people increasingly want to be part of it, so the fact of more visiting boats is in itself an encouragement for further growth. Currently, it looks as though there’ll be upwards of 600 visiting yachts of all shapes and sizes from more than 20 different countries using Dun Laoghaire Marina this year, including at least half a dozen superyachts. On average, the ordinary cruising boat stays 3 to 4 days, and while their crews find the draw of Dublin’s world-standard tourist attractions a significant appeal, they enjoy returning by DART to a fresh and lively port where the evening sailing programme may be getting under way. Another particular attraction is that an Airport bus route has a stop within a very short distance ashore. Dun Laoghaire rates highly for its convenience for long-distance crew changes. When you’ve settled into the ways of the sea but realize that dealing with shore realities will shortly be on the agenda, it’s encouraging to know there’s a port ahead where not only can they assist with that, but they can provide helpful printed mini-pocket guides to get the best of Dun Laoghaire while you’re waiting there for your new crew to arrive. Of course, while the Marina makes a high priority out of being visitor-helpful, it also goes out of its way to be user-friendly for its own berth-holders, and one particular service is relied on by visitors and locals alike. Dun Laoghaire Marina maintains a list of accredited marine specialists and service providers in the immediate neighbourhood, and the welcome feeling of reassurance that such a list is there – even if you don’t have to avail of it – is something which adds to the attraction of the package, while its inclusion in the town’s economic activity and local employment is of real significance as marine experts in all trades from electronics through engineering and boat repair to sail-making are kept busy. In all, it provides a welcome sense of reaching a centre of excellence when you enter the marina. As visiting cruisers make their way into Dun Laoghaire through late afternoon and early evening, those watching ashore will share the warming experience of another mini-voyage successfully completed. Not that departures and arrivals are restricted to morning and evening. At the height of summer, the Marina sees signs of life 24/7 as boats come and go at all hours depending on their destination and the timing of a favourable tide. As for those who are actually at home there, Paal Janson has analysed the figure to provide a useful database for anyone studying boat ownership and use. In terms of sail versus power, he reckons in the good times the ratio was 60% sail to 40% power, but there’s no doubt that in recession, there was more of a decline in powerboat ownership than with sailing boats. But as the good time roll again, some of the powerboats appearing are extremely impressive. Within the sailing boat category, the division between racing and pure cruiser is about 50/50, despite the fact that Dublin Bay Sailing Club’s programme is so firmly embedded in the Dun Laoghaire psyche that you’ll get boats racing with the DBSC fleet on a Thursday night that wouldn’t at all be seen as racers of any kind elsewhere. It is the range of users for which Dun Laoghaire Marina caters which underlines the breadth of the boat-minded community attracted to its convenient facilities. Since 2007, one of the fixtures of the Marina’s extensive “floating forecourt” has been a Personal Lift which facilitates the Irish Wheelchair Association in getting disabled sailors aboard boats adapted for their use. The Irish Wheelchair Association and Dun Laoghaire Marina have combined forces to provide a personal lift and convenient berthing for a specially modified RIB to take wheelchair users to sea, and it is a very frequently-used facility. The fact that this frequently-used setup is in Dun Laoghaire is a reminder of the marina’s inbuilt location advantage over every other marina in Ireland. Dun Laoghaire is conveniently at the heart of one of the largest populations in Ireland, and that population s right beside the sea. So if providers of specialist services of any kind for the boat population seek to increase their activities, they have to remind themselves that ultimately it is the numbers game which will be the key factor in their success. Thus if you’re going to building up a sailing school – whether inshore or offshore or both – then by being Dun Laoghaire-based, you’re providing your courses within easy reach of a lively, potentially affluent, and numerically large sector of the population. So although the longest-established of all Dun Laoghaire schools, the Rumball family’s Irish National Sailing School – runs its dinghy courses from facilities within the Inner Harbour beside its HQ, for its most recent ventures into offshore training it uses the marina for berthing requirement. And for several years now the marina has been the base for Ronan O Siochru’s Irish Offshore Sailing, which specialises in this area to such good effect that one of its training yachts, the 37ft Desert Star, was overall winner of the 33-boat Sailing Schools division in the Rolex Fastnet Race 2015. It was a matter of special pride for the Dun Laoghaire Marina staff that a boat which operated from their base should have achieved such international offshore acclaim, and since then standards have continued to rise, as the Irish National Sailing School are now also very much into the offshore game, with their J/109 lined up – like Desert Star – for participation in the Sailing Schools division in the Rolex Fastnet Race 2017 on Sunday 6th August. In fact, while IOS’s Desert Star is mainly providing dedicated offshore courses, INSS’s Jedi is into the complete Dublin Bay experience of racing inshore and offshore at the heart of the J/109 and Dublin Bay SC fleet. Thus there was a satisfying sense of completeness at the prize-giving which concluded the Volvo Dun Laoghaire Regatta 2017 on July 9th, when Jedi received her prize as runner-up in the J/109s, as she was also one of the boats receiving the special re-print of the historic engraving of July 1828, recording the very first regatta of all in what had become Kingstown Royal Harbour. It was an image which encapsulated the key elements in the story of the harbour. In the long run, the problems with the shallow entrance to Dublin Port were overcome by dredging development, and the replacement of sailing ships by engine-powered vessels. But Dun Laoghaire remained of use to ships as it had been designated the official cross-channel Ferry Port in 1834, and until warship sizes outgrew it early in the 20th century, it was throughout the later 1800s a naval base, with the advantage of direct rail connection to the main naval base off Cobh in Cork Harbour. However, although Dun Laoghaire Harbour was obliged to function within the size which had been decided for it in 1817, the increasing size of ships, together with the major changes in shore transport and acceptable road systems, increasingly restricted its potential as a commercial harbour and ferry port. Then too, the attractive residential nature of Dun Laoghaire’s waterfront terraces of houses was once more in the ascendant. For a period, many had become offices, but with the commercial shipping aspects of harbour activity reducing, recent years have seen the reversion of the harbourside houses – many of them very handsome buildings indeed – to residential use. This has been particularly marked with the new property boom, but it was already under way when the last Holyhead ferry sailed in September 2014, and since then the fact that the Dun Laoghaire waterfront is no longer cluttered with ferry traffic has added to the area’s appeal as somewhere to live and enjoy the sea air and the views of recreational boating activity in the harbour. As for the background, we know that that recreational sailing use started at least as early at 1828, and continues today, busier than ever. But as for ferryport use, that didn’t begin until 1834, and it ended in 2014. Admittedly the last relics of the ferry era are still much in evidence with the extensive shoreside marshalling yards at St Michael’s Pier and the former Ferry Terminal buildings still very much in existence. But as Dublin Port continues to develop its ferry and cruise liner berthing facilities at top speed, it is surely time for everyone in Dun Laoghaire to accept that their harbour’s future lies in another direction, a healthier direction for a place which is increasingly residential and recreational. Whatever the outcome, the fact is that Dun Laoghaire Marina is now the main focal point of waterfront activity. In marina terms, it’s a distinctly grown-up sort of place. With its good depths and extensive berthing, it can confidently provide the RNLI with accessible-all-hours berthing for its reserve lifeboats – when Afloat.ie was visiting this week, there were two in port, ready for action at a moment’s notice. And during the winter, naval, coastguard and customs vessels know they can rely on its spaciousness and total shelter when required. Thanks to its scale, it can cope with big boats and big events too. When Sidney Gavignet and his crew on the MOD 70 Oman Sailing were poised for a challenge at the Round Ireland Record in May 2016, they knew that they could base themselves in Dun Laoghaire marina without being under undue attention while they waited for the ideal conditions to materialise for what was a successful challenge. The three MOD 70s in Dun Laoghaire Marina before the Volvo Round Ireland Race in June 2016. Between them, they broke the Round Ireland Record three times in the summer of 2016.
legendary race boats and sailing rock stars, all in one place at a berth which would have been untenable had it not been for Dun Laoghaire Marina’s sheltering arms. So the contribution of the Marina to Dun Laoghaire’s rising status in international sailing deserves to be more widely recognised, as does the Marina’s significant contribution to many aspects of the local economy. But in making themselves and what they do more accessible to the general public, Paal Janson and his long-serving team are walking a tightrope, as they have to ensure urban-centre levels of security for the boats permanently berthed in their facility. Glamour visitors may come and go, but the longterm berth-holders underpin the entire operation, and their needs are equally important. So perhaps it would be better to acknowledge he success Dun Laoghaire Marina achieves in what it sets out to do, and focus again on one up-coming event in particular. That is the start of the 2017 Rolex Fastnet Race on Sunday August 6th. Desert Star from Irish Offshore Sailing in Dun Laoghaire Marina rounding the rock in the Rolex Fastnet Race 2015, on her way to winning the Sailing Schools class of 33 boats…………..
Of eleven entries with Irish involvement, six will be boats based in Dun Laoghaire Marina. That is clear evidence of the punch packed by the affluence of the Dun Laoghaire/Rathdown region, and the enthusiasm now being generated within Dun Laoghaire harbour. And of those six boats, two will be in the Sailing Schools Division - Irish Offshore Sailing’s Desert Star, and Irish National Sailing School’s Jedi. There must be few marinas in Europe, other than those around the Solent, which are sending forth two entries for the Sailing Schools’ prize in the Fastnet. Yet Dun Laoghaire Marina can do it with style, knowing that one of its boats was the overall winner last time round. In a repeat of last year's results, the Dragon East Coast Championships at the Royal Irish Yacht Club has been retained by by the Royal St. George Yacht Club's Neil Hegarty in Phantom crewed by David Williams and Kevin O'Boyle. One point behind in the 10–boat fleet was club-mate Martin Byrne's Jaguar with Conor Byrne and John Simms. Third was Friday's overnight fleet leader Little Fella sailed by Cameron Good, Simon Furney and Henry Kingston. Full results are downloadable below as a pdf file. Kinsale Yacht Club's Cameron Good sailing with Simon Furney and Henry Kingston lead the Irish East Coast Dragon Championships at the Royal Irish Yacht Club in Dun Laoghaire. Given Saturday's downpours, the ten boat Dragon fleet got the best of the weather on Friday and sailed two races in light winds and great sunshine. Good, steering Little Fella, has a four–point cushion over second placed Phantom (Neil Hegarty, David Williams, Kevin O'Boyle) of the RStGYC and Good's own clubmates Mar J (Adrian Bendon, Luke Kedney, Michelle Hayes) in third who both share seven–points overall. SB20 sailor Jimmy Dowling will host a training session on the basic techniques of handling the gennaker on Saturday morning, May 6. The session is aimed at the less experienced SB20 class members but all are welcome. A brief lecture, a demonstration and Q & A session commencing at 9.00 will be held in the wet bar (downstairs) at the Royal Irish Yacht Club. To whet the appetite, a video of Mark Rushall (below) making an immaculate gybe, represents the new standard to be achieved in DBSC racing after this session.